Written for the Principles of Surgery viva of the MRCS exam by an examiner at both the London and Glasgow Colleges of Surgery and a successful recent MRCS candidate, Principles of Surgery Vivas for the MRCS provides the reader with sample viva questions to enable them to prepare fully for this section of the examinations. In A-Z format for quick reference, this book will be invaluable to MRCS candidates, undergraduate medical students and those sitting the FRCOG examinations. It will also serve as a valuable 'aide memoire' for the training surgeon or doctor at all levels of experience, especially those training junior staff. 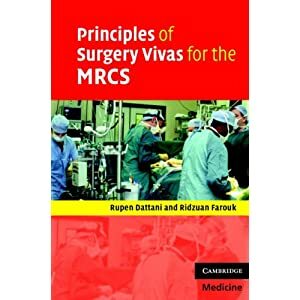 Principles of Surgery Vivas for the MRCS provides the reader with sample viva questions to enable them to prepare fully for the MRCS examinations.